In the post, “How to Develop The Force”, we shared a story of a temple in China where the internal life force (called “Chi”) was so strong that you could literally feel it in the ground and the air. There were many reasons why the Chi was so strong at this temple. Part of the reason is this temple was one of the oldest in China, home to monks who do nothing but practice developing their Chi every day. It was also about the location of this temple – high in the mountains and positioned overlooking a canyon – and the location of a massive old tree in the courtyard where the monks practiced. All of these things together contributed to amplifying the effects of the Chi in the area and having experienced it first-hand, I can tell you the feeling was nothing short of amazing – it literally took my breath away. The truth is you have developed your Chi to the level it is currently just by breathing normally every day. When you add in your martial arts training or any sort of vigorous exercise that increases your breathing and heart rate, you are also developing your Chi. But – if you really want to develop your own “Force” – it is about HOW you do your breathing and WHAT you focus on when doing it. 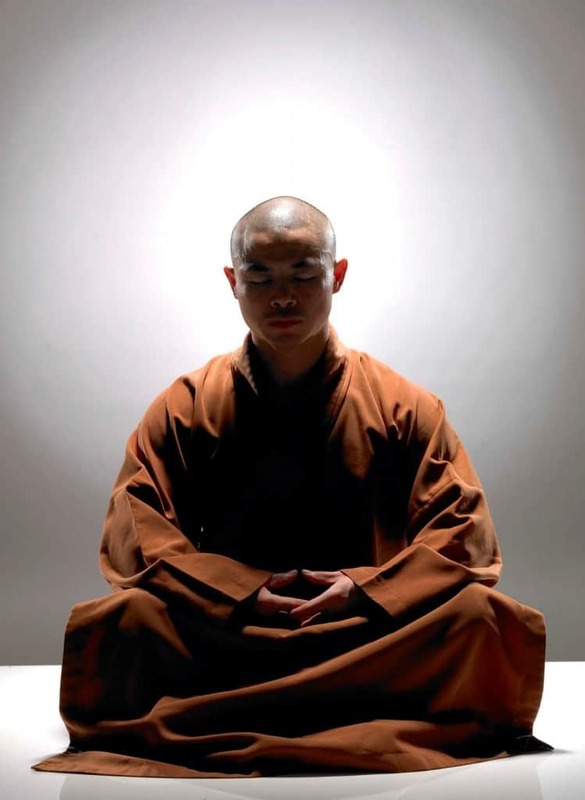 When you hear monks like Wang Bo talk about meditating while training or you see photos and videos of martial artists doing meditation exercises, what you don’t see is that they are actually working on their deep breathing and developing their chi. When you kneel and meditate at the beginning and ending of your class, part of what you are doing is readying yourself and clearing your mind; you can also work on your deep breathing at the same time. When you are practicing deep breathing, you are infusing every cell in your body with the “life force” of oxygen. When we talk about “deep breathing”, we are talking about breathing where you fill up from your lower abs/diaphragm (this is where your energy center in your body is, called the “Dan Tien” about an inch below your belly button); most of us barely inhale to 50% of our capacity, unless we are exercising. When you practice deep breathing properly, you can feel the difference in your energy almost immediately. Let’s try one together; read the following and then try it for yourself. It will take about a minute or so. Sit on the edge of your seat, feet flat, arms resting comfortably at your sides, palms flat on your thighs. Have your back straight – not stiff and uncomfortable, but not rounded or slouching, either. Head in a neutral position, tongue on the roof of your mouth just above your front teeth. Breathing in through your nose, begin filling your lungs, starting from your lower abs/diaphragm and moving UP. When you start to breathe in, your diaphragm should start to push OUT slowly. If you start to breathe in and your shoulders start to rise, that is incorrect. Relax and start over. Start breathing in slowly through your nose and as you do, picture bright sunlight or energy going in your nose, down to your energy center (the one below your belly button) and filling it up. Keep filling up your body with energy and oxygen until your diaphragm is fully extended and you feel as if you can’t bring in any more air. At the top of your inhale – HOLD IT very briefly, like a second or two pause – then SLOWLY breathe out of your nose or mouth. Try to make your breath out twice as long as the breath that went in. As you are breathing out, release any negative energy, fear, tension. Let your shoulders drop and relax as you slowly exhale, pushing all the air out. When you get to the bottom of your breath out, pause and start over if you wish. Once you go ahead and do this yourself, check out how you feel after just one breath. I know when I do this, it feels amazing. Imagine doing this for five, ten minutes straight a day – how would that make you feel? This is just the beginning of what is possible when you begin to practice deep breathing. The Shaolin Monks of China are just one small group of people across the world that know the power of deep breathing and how it can help develop “Chi”. If you decide to join us for the Z-Ultimate China Tour 2016, you will get the chance to see – and study – the Shaolin Monks plus other monks that are masters of the internal arts and deep breathing as they practice their deep breathing exercises, along with many other martial arts skills. If you would like more details on the trip and how to register, please CLICK HERE. In the meantime, you can practice this exercise every chance you get – even if it is a short time during meditation before and after class. I know you will be pleasantly surprised at the results. P.S. – Just doing this exercise five minutes a day can make a huge difference in how you feel. Try it for yourself and let us know your results in the comments anytime.